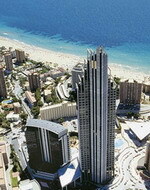 The Gran Hotel Bali is located in Benidorm, on the Costa Blanca, Spain, 400 metres from the beach and the city centre. Terra Mitica Theme Park is two kilometres from the hotel. This sleek, high-rise hotel is spread over two buildings, one of which is the highest in Europe and features 18 elevators, two offering panoramic views. The Gran Hotel Bali features a health and beauty area with a hot tub, sauna, gym, massage-treatment room, and an aerobics studio with fitness classes. An Aesthetic Medicine Department offers facial and body treatments such as lip enlargement, Mesotherapy, and nutritional treatments. There is also an open-air hot tub and three swimming pools, each with a sun terrace and poolside bar. 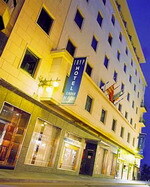 Wireless Internet access is available throughout the hotel. 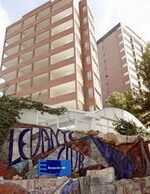 There are two restaurants offering show cooking and buffet dishes, and four bars and cafeterias. 24-hour room service is available. The half-board rate includes breakfast and lunch or dinner. 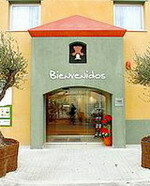 The Hotel Marconi is a modern seafront property set opposite the sandy Poniente Beach and 100 metres from the resort's busy port area and harbour. The nearest golf course is 45 kilometres from the hotel, and Aqualandia water park and the Mundomar marine and exotic animal park are two kilometres away. It is four kilometres to the Terra Mitica theme park. 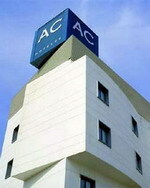 Alicante International Airport is an approximate driving time of 45 minutes, a distance of 55 kilometres from the hotel. 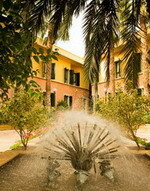 The hotel's restaurant serves a menu of Mediterranean and international dishes, in a relaxed, air-conditioned atmosphere. Guests can relax with drinks, snacks and ice creams in the hotel's air-conditioned bar-cafeteria, and swim in the rooftop pool which offers dramatic views of the Valencian coast. Practical amenities include a 24-hour front desk where days on the golf course can be organised.. The Hotel Sol Costa Blanca is a modern, purpose-built block adjacent to a sandy beach, just 500 metres from the lively centre of Benidorm. Guests are in a perfect position for exploring the area; the Aqualandia water park is three kilometres from the hotel, and the traditional mountain village of Guadalest is 27 kilometres away. 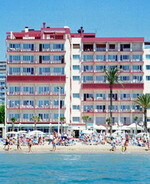 The Sol Costablanca Restaurant features air conditioning, show cooking, and excellent sea views, and serves international and Spanish cuisine buffet style. 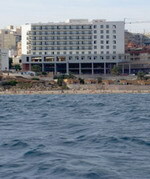 The hotel boasts an outdoor pool with a poolside bar, and a terrace with sea views. It also has its own hair salon, and guests can benefit from the television lounge and games room. In the evenings there is dancing with live music, plus regular shows. Calpe - Calpe is a delightful, friendly fishing village situated in the middle of Spain's Costa Blanca, nestling on a gently rising hillside at one end of the broad sweep of a sandy bay it overlooks the most outstanding landmark of this coast the towering Penon de Ifach jutting out into the sea over 1000 ft. In contrast to the larger commercialised resorts, the village of Calpe with its narrow winding streets, traditional Spanish architecture and street markets generates an atmosphere of friendship and relaxation, a village where after only a few days you seem to know and greet everyone. Calpe will surprise you with its daring contrasts, where modern buildings and wide avenues harmonize with an ancient fishing village, where locals are proud of their past, yet welcome tourists and visitors with warm-hearted hospitality. 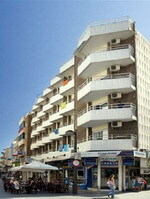 Located on the beachfront at Playa del Arenal, this modern hotel is located in Calpe’s historic city centre. 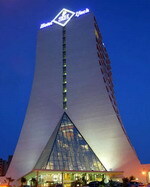 From here you can admire fantastic views of the iconic Rock of Ifach. Relax on the sandy beach or head to the hotel’s spa facility, where you can enjoy a session in the heated pool and jacuzzi. You can also choose to take part in the exciting activities arranged by the hotel, including kite surfing, jeep safaris and quad biking in the surrounding countryside. After a busy day you can enjoy the Mediterranean and international dishes prepared in the show kitchen of the hotel’s buffet restaurant. Calpe is built around a pretty fishing port easily explored from the hotel. Outside the city you will find a number of good golf clubs and family attractions, such as the nearby theme parks of Terra Mítica, Terra Natura, Mundomar and Aqualandia. Dénia - a pretty and friendly town situated on the Mediterranean coast between the cities of Alicante and Valencia. Popular with tourists during the summer months. 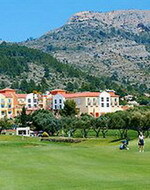 Nearby is the popular resort town of Xàbia. 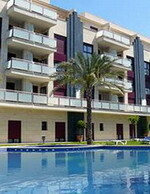 Denia is home to a castle located on on a rocky crag overlooking the city. It t was built in the 11th and 12th century and offers views around the sea, the city and the backlands. Within the castle is the Palau del Governador with its museum. Denia is also home to the Museo Etnologico with further details on the history and culture of the city. The ferry to Ibiza and the other Balearic Islands departs from Denia daily. The city also serves as a terminus for a metre gauge railway line through the mountains from Alicante (popularly known as the (Limón Express), run by FGV. The popular bonfire festival is celebrated each March. Huge paper mache statues, called fallas are set up throughout the town, and then set ablaze. The popular Bous a la Mar (meaning "Bulls at the Sea") is held in July. The highlight of this week long festival is watching bulls run down the main street Marques de Campo, only to be chased into the Mediterranean sea by those daring enough to enter a makeshift bull ring with them. 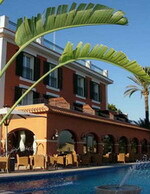 Elche - the third most populous city of the Valencian Region. Elche encompasses the entire range of attractions that the province has to offer its visitors: pre-history, history, natural riches, beaches and the influence of its citizens on culture and traditions are all elements that are worthy of note in this modern, thriving and growing city. Main sights: Elche Palm Grove (better known as Palmeral de Elche in Spanish, or as Palmerar d'Elx in Valencian). It is an orchard of over 200,000 palm trees that was declared a World Heritage Site by UNESCO in 2000. Altamira Castle, also known as Alcázar de la Señoría, located next to the Municipal Park (which, in turn, is a part of the Elche Palm Grove) It was originally built in Almohad times (12th-13th centuries), and was later renovated with brick exterior in the 15th century. A former fortress, in 1913 it became a fabric plant, it has also been used as the town hall and as a prison during the Spanish Civil War, while today is home to the Elche Archaeology and History Museum (Museo Arqueológico y de Historia de Elche).